The formerly Muslim- ruled areas of the Iberian Peninsula, Al-Andalus, feature some of the most unique palaces, mosques, minarets and fortresses in Europe. Andalusian architecture can be considered a rare architectural gem in the continent. The rich architectural heritage of Spain’s Islamic centuries (AD 711-1492) was specifically exotic and beautiful. Andalusia may be gone, but the magnificent Andalusian architecture will live forever, if not in real life then in pictures and drawings. Here are some of the most glorious examples of Andalusian architecture. The Great Mosque of Cordoba, locally known as Mezquita-Catedral, is one of the oldest standing structures from Al-Andalus. Muslim Caliphs used to construct a grand mosque as their first action when taking over a new country, Cordoba was no exception in that. It was an exception however in the novel design of the mosque. Cordoba mosque introduced several innovative architectural and ornamental techniques that became a distinctive part of Andalusian architecture. 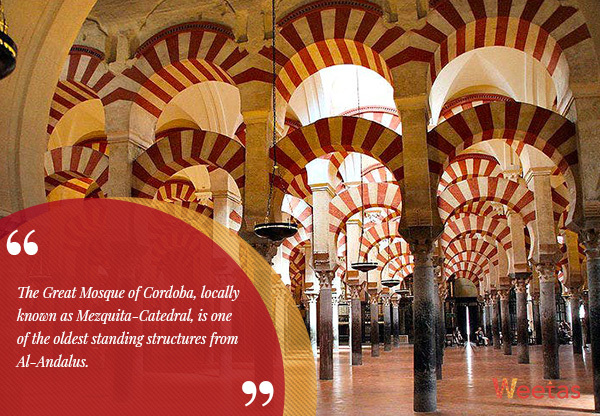 The Mosque of Cordoba was first founded in 787 by the Caliph Abdurrahman I. Its construction continued over the years in the form of restoration and extension as each succeeding Caliph added his contribution to the structure. Fascinatingly though, the building preserved its unity and harmony as if it was built at once. 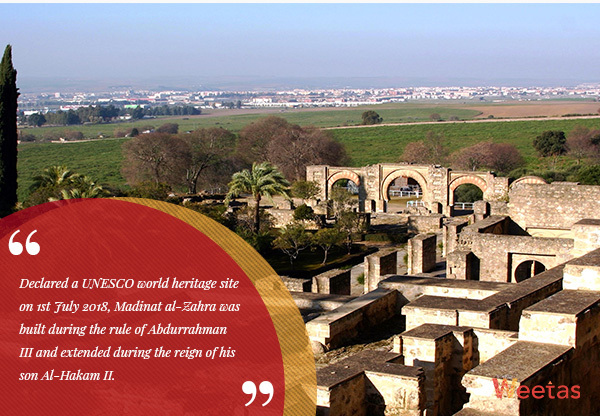 Declared a UNESCO world heritage site on 1st July 2018, Madinat al-Zahra was built during the rule of Abdurrahman III and extended during the reign of his son Al-Hakam II. The palace was a complex of buildings with vast terraces. It features indoor and outdoor spaces combined with gardens and fountains. And the whole complex is surrounded by walls and pillars intricately decorated with carvings and tilework. From an architectural point of view, Medina Al-Zahra played a great role in shaping a distinct Islamic Andalusian architecture. Many features of its design, such as basilical royal reception halls, have been used for the first time. Other designs in the city however clearly resemble the architecture of the era; The Mosque of Medina Azahara for instance bears close resemblance to the Great Mosque of Córdoba. 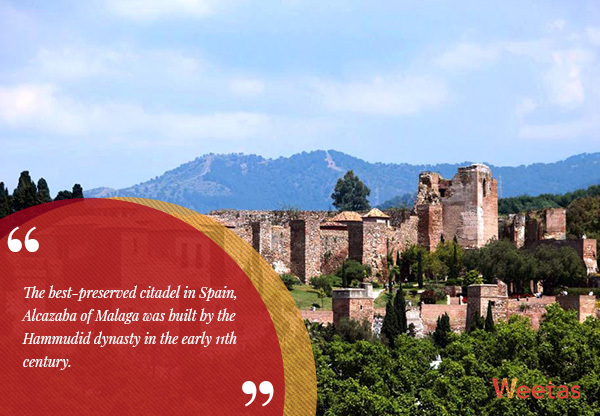 The best-preserved citadel in Spain, Alcazaba of Malaga was built by the Hammudid dynasty in the early 11th century. With its double walls and massive entry fortifications, the citadel is considered as the prototype of military architecture in the Taifa period. It bears some resemblance with the castle of Krak des Chevaliers in Syria. With its impressive location overlooking the city and the bay, the fortress combines military components such as turrets, arrow slits and battlements with the beautiful characteristics of an Arab palace organized around rectangular patios, gardens and pools. 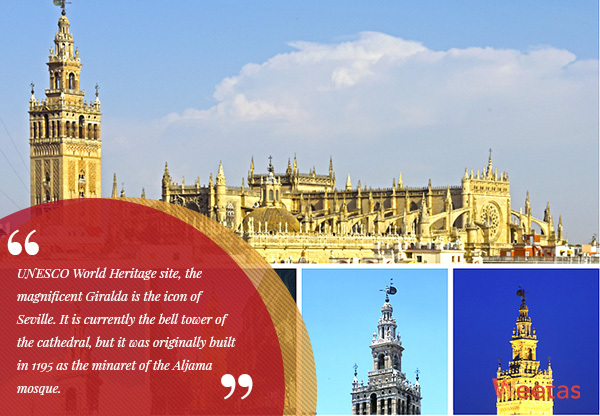 UNESCO World Heritage site, the magnificent Giralda is the icon of Seville. It is currently the bell tower of the cathedral, but it was originally built in 1195 as the minaret of the Aljama mosque. The Giralda was built during the brief period when Ishbiliyah was ruled by the North African Muslim dynasty called the Almohads. Under their leadership, Seville became the capital of al-Andalus. With an impressive height of 103 meters, the Giralda was the tallest building in Seville for more than 800 years. Thanks to a book by an Arab historian who lived in that era and kept track of its milestones we know a lot about the building of the minaret. One of the details that survived is that the chief architect who built the mosque and the renowned minaret was Ahmad ibn Basu. Even though this mosque has relatively small dimensions compared with other monuments of Andalusia, it has many of the basic elements which define Andalusian architecture. Moreover, what the mosque lacks in space it makes for in exquisite beauty. 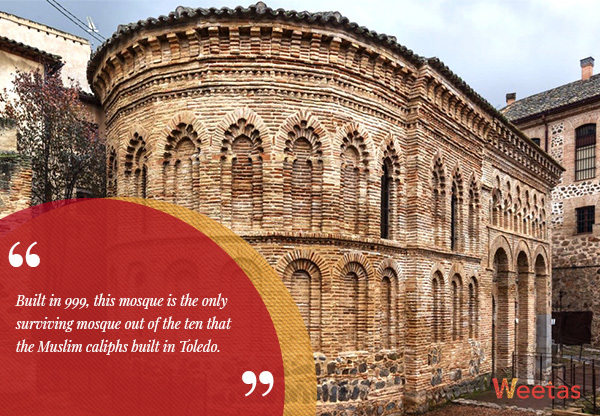 Built in 999, this mosque is the only surviving mosque out of the ten that the Muslim caliphs built in Toledo. In 1186 the mosque was converted to a chapel. The church portion of the structure is thought to be the first building of the Mudejar style. The label Mudejar was given to gifted Muslim artisans who stayed on in areas conquered by the Christians and worked with them. Mudejar architecture is a transitional period that is often considered a part of Spain’s Islamic heritage.